Javi here. I am not the biggest fan of Seth MacFarlene, his animation style, his shows or just about anything that he's done. I have actively apologized for doing my part in bringing FAMILY GUY back on the air. 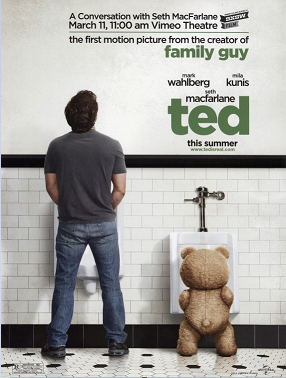 Now, MacFarlene is coming to the big screen with his movie TED. The story is essentially about a man (Mark Wahlberg) who wished for his childhood teddy bear, Ted (no way! ), to come to life. Now that he is a grown up and is trying to have an adult relationship with Lori (Mila Kunis), Ted is getting in the way with his rather rude and vulgar ways. Now, thanks to Funny or Die via Coming Soon, we have the red band trailer. Check it out after the jump. So, I'm not going to lie, I did laugh a few times during this trailer. However, I am worried about the story itself and how this kind of humor will be sustained during the running time. On the other other hand, I do love Mark Wahlberg when he is doing comedy. Between I <3 HUCKABEES and THE OTHER GUYS, I think that he does some of his best work. When it's all said and done the trailer has good and bad parts that keep me from anything but apathetically curious, if that's even a thing. What do you guys think about the trailer? I am pretty curious to hear other people's opinions.